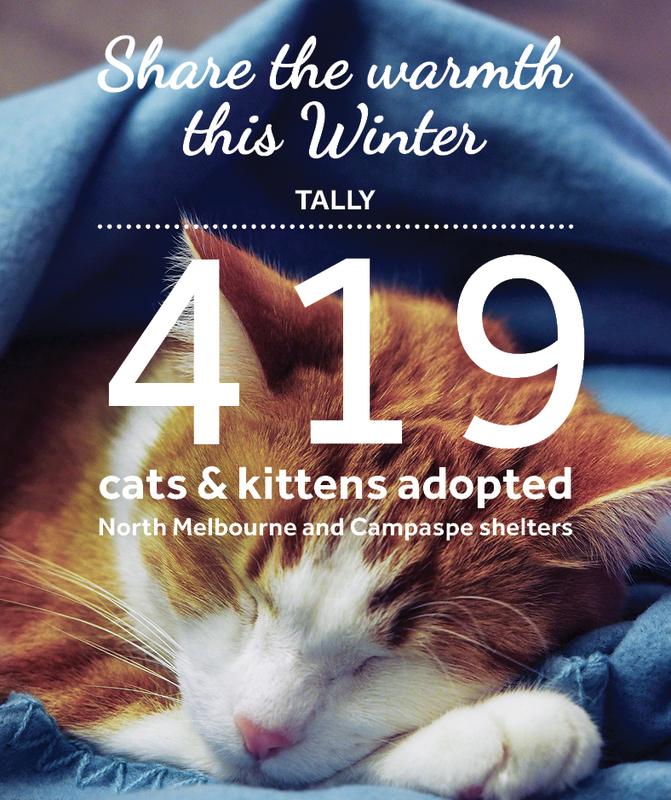 SHARE THE WARMTH: 419 adoptions with two days to go! For many of us the pinnacle of happiness is a warm hug from a loved one. So far through our Share the Warmth campaign 419 cats and kittens are now sharing warm hugs of happiness with their new owners! If you have been thinking of adopting a charismatic cat or a kind kitten, but have been holding off, now might be the right time to adopt a new member into your family. We are still bursting at the seams with a large number of cats and kittens looking for a new home. Could you be their purrfect match? Until June 30, that’s tomorrow, we are waiving the adoption fee for all adult cats six months and over and halving the adoption fee to $85 for kittens under six months. Each cat is desexed, microchipped, wormed, vaccinated and vet checked, which equals more than $300 of vet care included in each cat’s adoption. You can also use the power of social media or good old word of mouth to advocate for the fantastic felines in our care looking for a home this winter. Check out dogshome.com/cat-adoption to see the cats and kittens currently waiting to find their forever home and spread the word! Adopt: View our terrific range of cats and kittens at dogshome.com or visit your nearest shelter to meet them in person — our staff are keen to find you your perfect match! Remember you will need to complete your Pet Licence Test to take advantage of these offers.